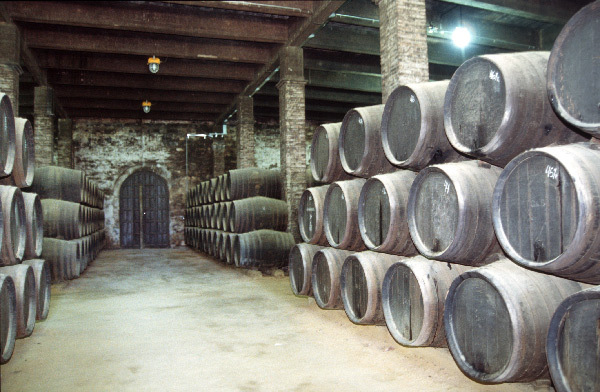 Barrels are used to age wine, and other beverages such as wiskey and beer. 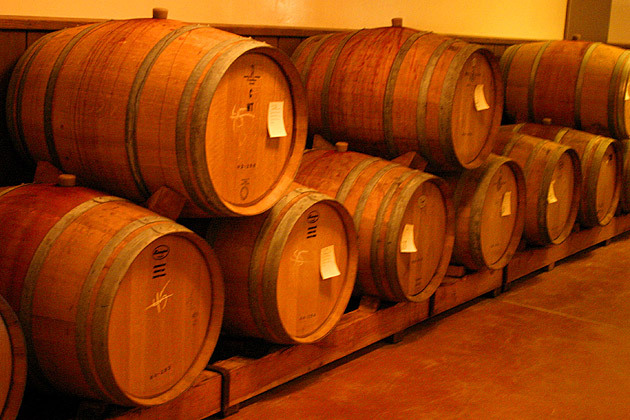 A barrel is also used to measure liquids. One barrel of oil is about 158.987 litres (42 US gallons). It is shortened as "bbl". This use may have come from the early Pennsylvanian oil fields where wooden barrels were used to store and move oil around. In 1866, the people of West Virginia started using it regularly. At this time, the amount was set to 42 American gallons. It was later world-wide for measuring amounts of oil and pricing it. Today, oil is rarely stored or transported in actual barrels, but the term "barrel" is still used to mean a 42-gallon measurement. A barrel can also be used to measure dry goods. For example, a barrel can mean 196 pounds (89 kilograms) of flour. The size of some standard barrels is not the same in all countries. Some countries have different sizes for different liquids. In the United Kingdom, there is a standard barrel for beer. It is 36 imperial gallons ( about 163 litres). In the United States, a standard barrel for liquids is 31.5 US gallons (about 119.2 litres). For beer, the standard barrel is 31 US gallons (117.3 litres), because of tax laws. A physical metal barrel for oil or chemicals usually holds 55 US gallons, but the word "barrel" used as a measurement refers to a 42-gallon measurement. The first people to start using barrels were the Celts about 350 BC. The Roman Empire started using barrels after trading with the Celts. 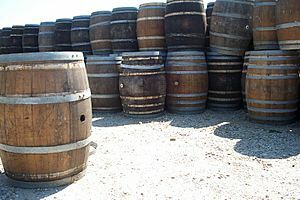 Barrels remained popular for shipping items until the 20th century. Sherry barrel with special glass barrel head to show barrel's contents; note the layer of flor floating on top of the wine. Barrel Facts for Kids. Kiddle Encyclopedia.